Functional - Keyport keys are compatible with most std. house & car keys. Organized - Keyport keys are always in the same spots and labelled. Multipurpose - Keyport inserts include USB, LED light, bottle opener & more. Safe - Keyport does not have sharp edges, reducing damage while in your pocket. 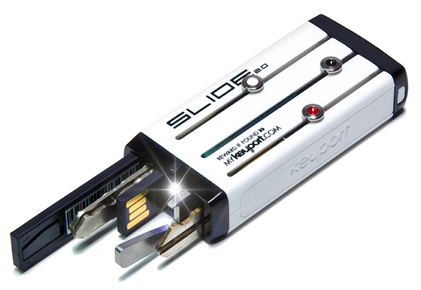 Durable - Keyport Slide is made of polycarbonate and stainless steel. It's resilient, tough & light. Recoverable - Keyport Lost & Found Program can reunite found devices with their owners. Key Chain Reinvented! Keys are still important but key chains are a thing of the past. Replace your keys with Keyport Blades. Our unique key blanks that come retrofitted with our patented one-size-fits-all heads. You can also choose from various Keyport Inserts. Customize your Keyport Slide 2.0 with removable Side Plates. Accessorize your Keyport with an array of options. or for attaching your Keyport to a zipper, bag, backpack, or belt loop.